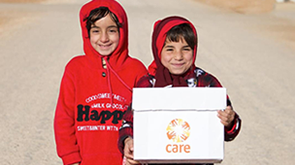 CARE worked in Azerbaijan from the mid-1990s to 2015. We sought to address the underlying causes of poverty through a combination of income generation and business development, agriculture extension and infrastructure rehabilitation, good governance and civil society development. We worked in peacebuilding projects and offered long-term development support to the poorest rural communities. Our work with women aimed to empower them to stand up for their rights and take an active part in decision-making in their communities. We also worked to improve people’s opportunities to earn a decent living through access to credit, training and technical advice.